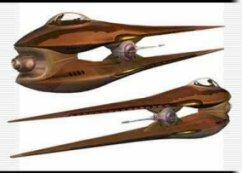 This unusual needle nose fighter was a significant presence on the side of the Separtists during the Clone Wars. Designed for a Geonosian biology, it is flown through the transmission of pheremones. A tough design, its one weakness is its lack of armament, carrying only a single modified laser cannon. However, it has several design features to maximize its advantage, including a greater field of fire due to the ball turret in the front of the craft and a longer range through the use of focused micro-tractors increasing the coherency of the laser bolts. Can only be flown by Geonosians.